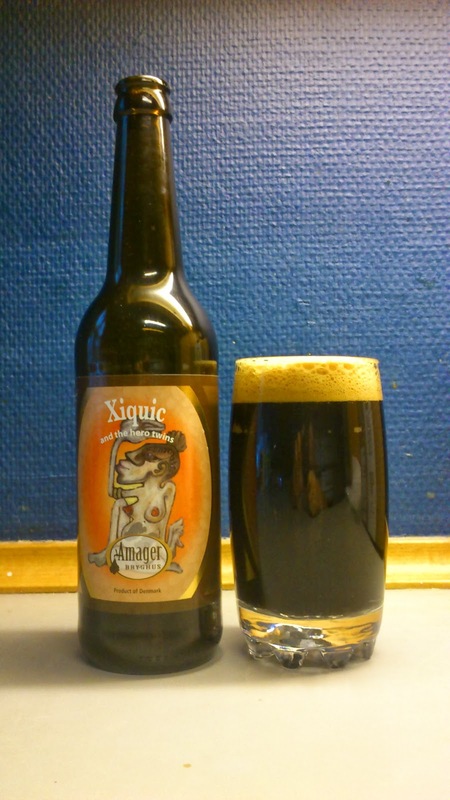 Who Xiquic was, is a bit hard to explain - but we all know the hero twins: Wayne Wambles and Jacob Storm - headbrewers of Cigar City Brewing in Tampa, FL and Amager Bryghus, Denmark respectively. Since his first visit at Amager back in 2011 Wayne has been quite the idol for us. We don’t believe it’s possible to find anyone with a bigger heart in brewing - combined with the utmost passion and sense for detail. Therefore it was a great honor to us that Wayne accepted our invitation to come brew at Amager Bryghus - even on his birthday! A recipe was created from what seemed like an endless stream of emails. The Cigar City signature cedar wood was ordered and a birthday cake was baked. We had a fun day - we hope you’ll have fun enjoying this double mash cedar infused black pepper Imperial Stout, yeah, no kiddin’. It’s a bit of a beast - but a gentle one. Nice aroma of roasted malt, mild coffee, chocolate, black pepper and wood from the pour. This one pours pitch black with a creamy tan head. Spicy ! intake with roasted malt, hops, dark bitter chocolate and coffee while the finish is dry, sweetish and hoppy. Cocoa powder and mild chili pepper spice linger in the long aftertaste. Lowly carbonated, the mouthfeel is smooth and creamy. Alcohol is noticeable but more as a warming effect than masking the flavours. Wow, extremely busy beer with a whole lot going on. One minute I had something down as juniper berries, the next it was gone and replaced with something else. I'm also sure there is a spice in there that is in a lot of danish xmas beers but I failed to pin it down. If I drank another bottle another day I could pick up a whole lot more different flavours...which I might just do. This is certainly a beer to make you think. I really enjoyed this one, no problem here drinking another. Summing up, a cracking complex beer that will make you think, well worth trying ! This scored 8/10 on the 'yaaaas !, no licorice' Beerometer. Where to buy CPH : Kihoskh and Ølbutikken had it in stock at time of writing.